Satisfaction guaranteed or your full refund! Vintage Tomy Answer Clock Learn to tell time! Just push the red button on the left to move the clock hands. Push the red button on the right and the Owl's eyes open to reveal the time. Measures 10" x 7" x 3" Great vintage condition! Minor surface wear consistent with age/use. Works with no issues. In pretty good shape, may have markings and imperfections. You are buying this item as is, and as found and as pictured. TOMY Tic-Tock Answer Clock. Ages 3 years and UP. Vintage 1975 Wise Owl Teaching Timer Clock Sears Red Blue by Tomy Fair Condition. Please see pictures as this is the exact Tomy owl clock you will receive. Lots of wear but works great. I am not sure if plastic is suppose to cover the face of clock, but it doesn’t as shown Ships fast from smoke and pet free home within 24 hours of payment More toys listed in my store. Happy to combine shipping on multiple items purchased. Buy with confidence, check out my feedback! 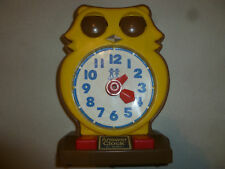 Tomy Owl Answer Clock. One of the clock hands is broken. 1975 Tomy Answer Clock adds fun to learning. Just push the red button on the left to move the clock hands.